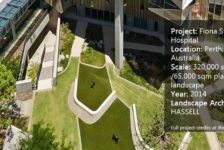 Article by Irene Crowo Nielsen – Barangaroo Reserve by Peter Walker and Partners Landscape Architecture (PWP), in association with Sydney-based Johnson Pilton Walker Architects and Landscape Architects, in Sydney, NSW, Australia. Move over Opera House, Darling Harbor, Harbor Bridge and Bondi beach, there is a new kid in town. 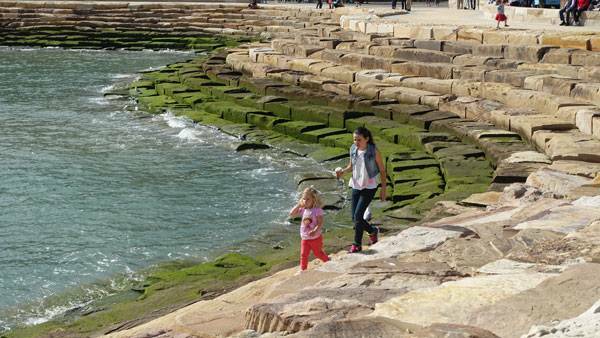 Barangaroo Reserve is definitely competing for a top-three spot for tourist attractions in Sydney. 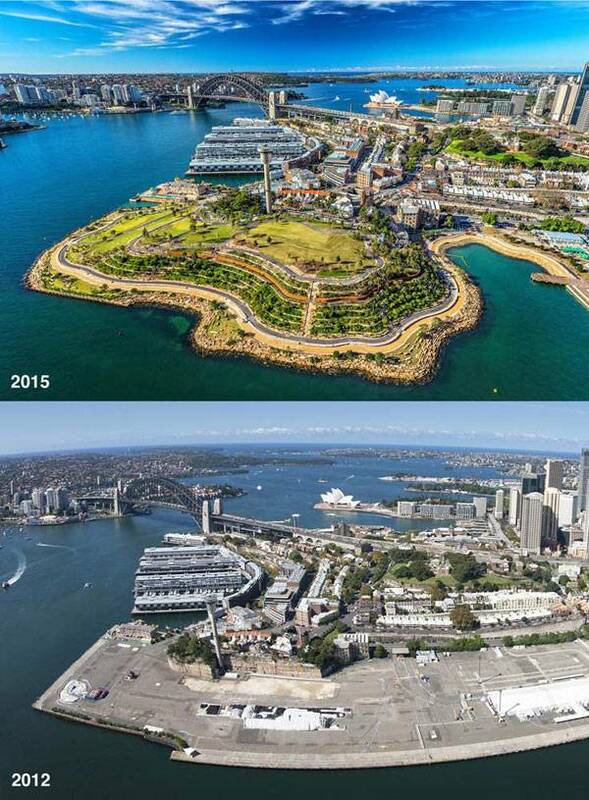 A six-hectare abandoned industrial dock area in Sydney Harbor dating all the way back to 1836 is now gone. 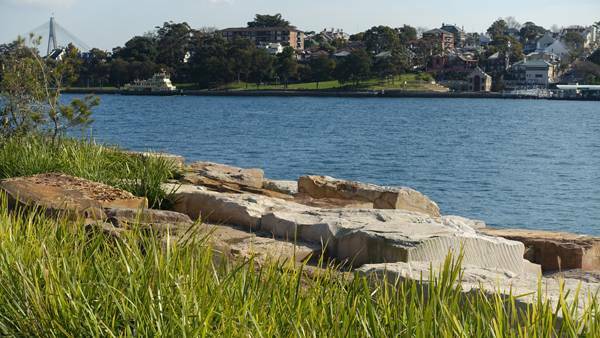 Rising from its ashes is the Barangaroo Reserve, a lush headland park with its historical shoreline reclaimed. The land has literally been lifted 18 meters to match its original landform profile. 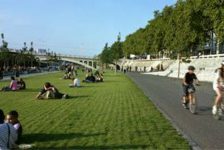 Local residents are able to walk straight out from their houses and visitors are able to walk directly from the streets, through the park, towards the harbor for the first time in 140 years! Imagine the views! 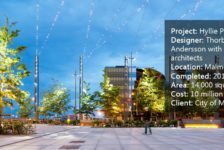 Peter Walker and Partners Landscape Architecture (PWP), in association with Sydney-based Johnson Pilton Walker Architects and Landscape Architects, set out on the task to design and re-create the historic headland. Inspired by vintage paintings, plans and photography, all documented with geomorphic evidence, they set out on the challenge together with a team of engineers, botanists, horticultural guides and soil scientists. 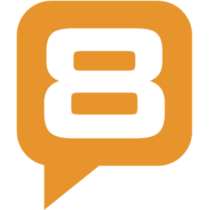 How did they fulfill this historically important task? 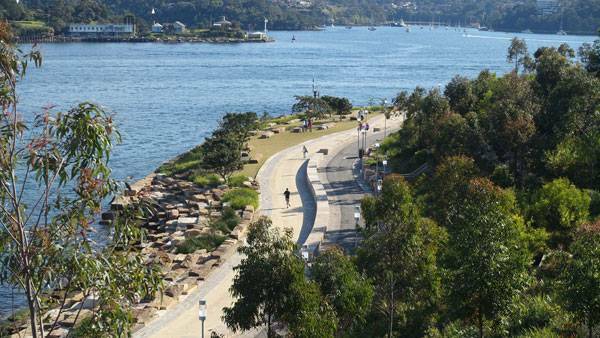 Barangaroo Reserve is named after an influential Aboriginal businesswoman from the time of early colonial settlement in Sydney. Barangaroo made an income from selling surplus fish to newly-arrived, hungry colonials. In fact, she was the first Aboriginal woman to do so. 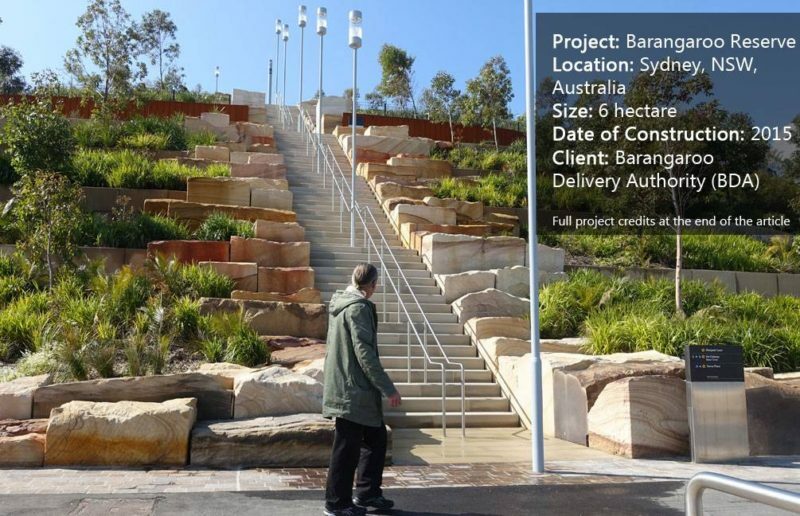 Barangaroo Reserve is a re-created headland park situated on the Western Harbor foreshore of Sydney´s Central Business District, it opened September 2015. Before 1836, one could walk around Sydney´s foreshore without losing connection to the waterfront. Miller’s Point was the headland’s original name before it was dramatically cut away in 1836 to make room for wharves, containers and maritime industrialization, which continued all the way into the 1960’s. The beautiful foreshore of Sydney closed down for the public and has been closed ever since, until now. 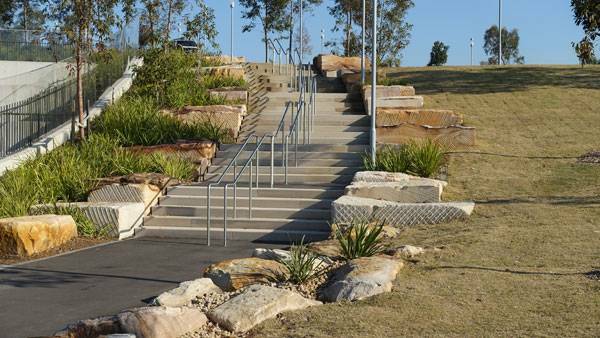 PWP Landscape Architecture has cleverly designed the park in three levels, level 1 being the “Foreshore/Promenade”, level 2 being the “Bush Walk” and the upper level 3 being the “Upper Bluff”. 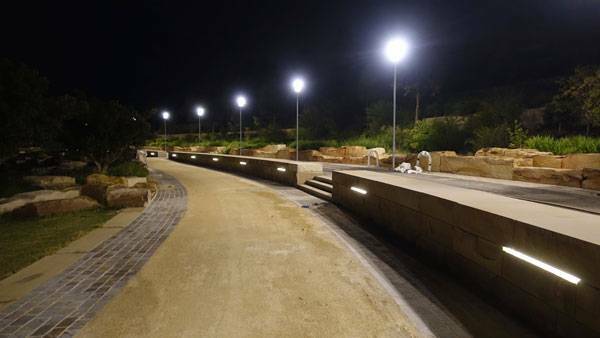 The Foreshore Promenade runs along the harbor in a 2 km continuous public waterfront walk alongside a stone wall marking the historic 1836 foreshore edge. 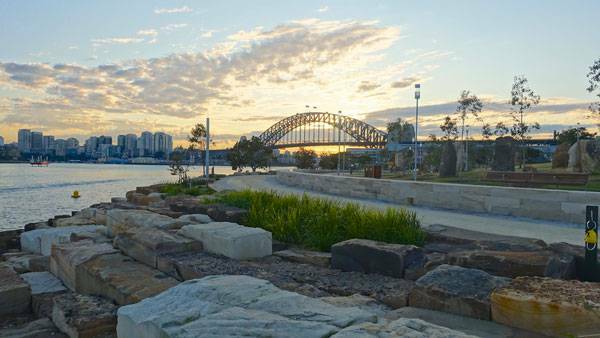 The Foreshore is built with large sandstone blocks, a material that references both the topography and the building material of early Sydney. The style represents the natural formation known of the coast as “tessellated pavement”, which bears its name because it is a relatively flat rock fractured into polygonal blocks that resemble the tiles of a mosaic floor. The sandstone was excavated onsite using more than 10,000 sandstone blocks. When tidal water gets in the sandstone blocks, it creates different opportunities for engagement; sitting, looking at tidal pools, rocky beaches, to mention a few. 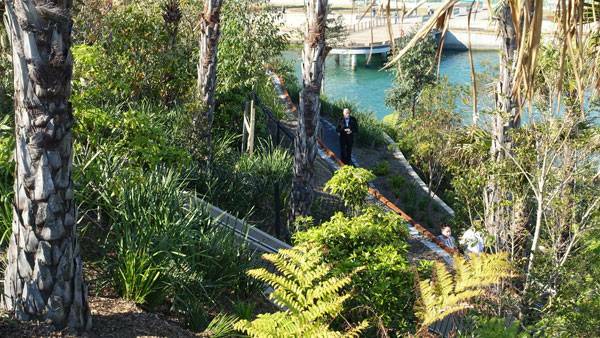 The “Bush Walk” is a great contrast to the open Foreshore Promenade. It is a more intimate, shaded path, densely packed with bushes and native trees, that runs up-slope. It terminates at the “Upper Bluff” with picture-perfect views of the Harbor. The Upper Bluff is the highest point of Headland Park. 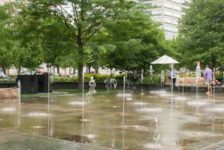 It has gentle slopes that invite users for relaxing recreation. In contrast to the shaded Bush Walk, Upper Bluff is more open, but with clusters of large fig trees and eucalyptus. Canopy layers of trees 10 to 20 meters in height that form a series of cathedral-like spaces, above the bush planting layers. 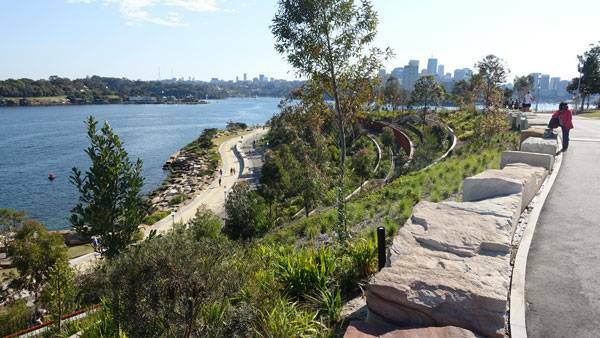 Barangaroo Reserve now consists of more than 75,000 plantings native not only to Australia, but which are site-specific to the Sydney region. In fact, 79 of the total 84 species chosen are native to Sydney Harbor dating 200 years back to the time of European settlement. Many of these species was hard to find in the local nurseries so seeds and cuttings were collected from wild sites around Sydney Harbor and the Hawkesbury River. 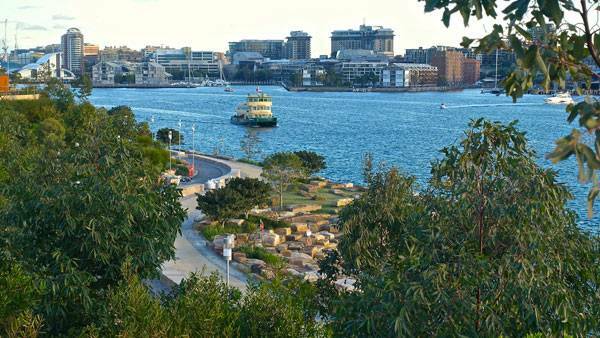 16 mature fig trees and 89 cabbage tree palms were transplanted into the park because the Authority wanted Barangaroo Reserve to open with maximum visual impact. Much of the planting is on steep terraces that follow the line of the foreshore. 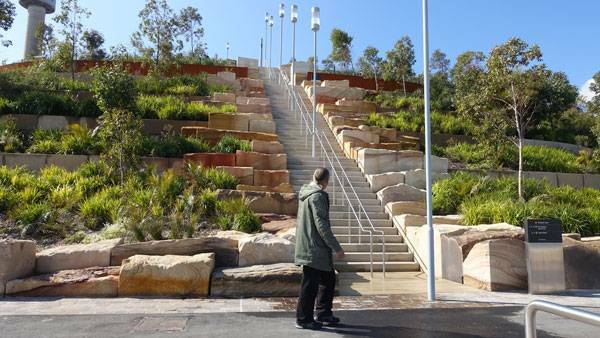 Being a visitor at Barangaroo Reserve is anything but boring. 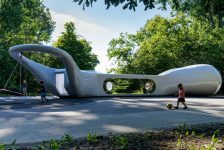 One could say it is a park and an entertainment space that appeals to all ages. 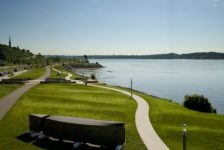 The headland park features everything you need for an active or relaxing day out with your family or friends; bush walks, lawns perfect for picnics, shared walking and cycling tracks and two new harbor coves. There is even a massive cultural space built beneath the park called “The Cutaway” which is used for indoor events and exhibitions. 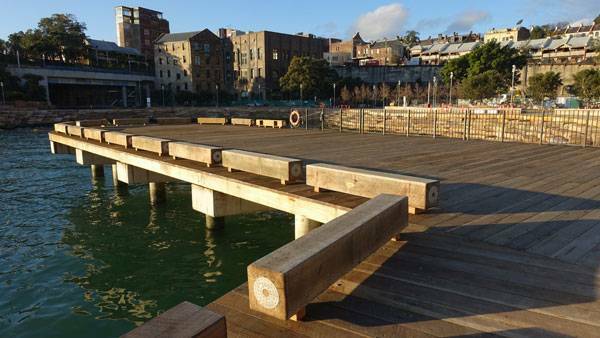 PWP Landscape Architects and the rest of the team have successfully managed to revitalize a 6-hectare former impermeable container wharf into a 6-hectare permeable headland park, mixing something old with something new. 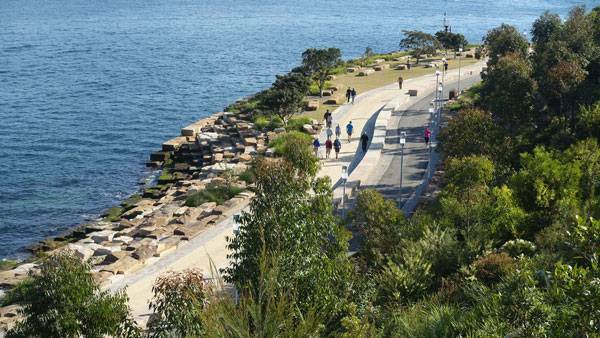 The connection with the other Sydney headlands has been restored while at the same time a complex ecology system has been implemented all together with a revitalized park! 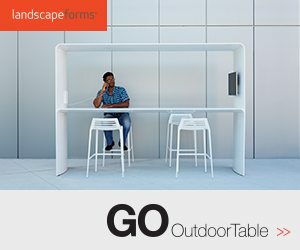 How would you set out on a task like this?